A spiritual plan of life helps you to grow in holiness and discern your vocation. When crafting your plan, make sure that it is reasonable and achievable -something you can really carry out in your current state of life. 1. Recite the Our Father prayer [ask God for your “daily bread,” the grace you need to serve Him well that day] Think ahead to all of your duties for the upcoming day, whether at work, at school, at home, or with friends. Offer these to God and resolve to do them well as a sign of your love for Him. Beg Him for grace to live the day well. Recite the Morning Offering prayer: Lord Jesus, I worship You. I offer You all of the prayers, works, joys, and sufferings of this day as a sign of my love for You. Help me to keep You in mind throughout this day, and give me the grace to serve You well. 2. Attend daily Mass. It is the perfect Morning Offering. It enables you to pray with Jesus to the Father. It enables you to receive His power in the Holy Eucharist, our daily bread. Try to go once a week or a few times a month, on Saturday if you can’t make it on a weekday. 1. 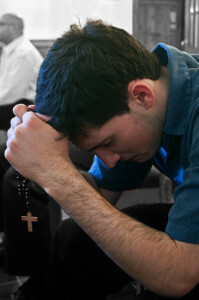 One form of mid-day prayer is the Rosary. You could pray just one decade or even all 5 decades. Pray it slowly, asking Mary to deepen your friendship with her son, Jesus. 2. Lectio divina is an excellent form of mid-day prayer. The Pope highly encourages it. Lectio divina means “divine reading” or “holy reading.” This is a way to use the Bible in your prayer. Don’t just read the Bible; pray the Bible! Carve out 5-10 minutes in your day for lectio divina. Focus on the Gospel from Mass that day. Download/bookmark the daily Missal app. on the computer, or use a daily Missal, or some magazine (such as Magnificat or Word Among Us comprehensive). Read the Gospel through once. Then slowly read it again, looking for a word or phrase that catches your attention. Let God speak to you through them. When you find one, stop and think “What are you trying to tell me, God? How does this apply to me or my situation?” Don’t simply try to understand the meaning of the whole reading, but rather focus on words and phrases. After you have reflected for a few moments, continue reading and look for another word or phrase that sticks out for you. Sometimes God will engender ideas or memories. Other days, He might simply calm us down or strengthen us to deal with our temptations. In the evening, take a few minutes of quiet prayer to do a Daily Examen. Quiet your mind and heart for a moment to recognize the presence of God with you. Notice the Lord gazing upon you. Then take some time to review the events of the day with Him—what did you do? Whom did you meet? What happened to you? As you review these moments, notice the feelings that arise and express them to God. Then take one moment and pray with that moment or feeling—something that stands out to you. What is God showing you through that? Then consider how you have lived for God today—have you loved others as He has asked? What more could you do for God tomorrow? Moments of Gratitude. Another form of the daily examen consists of simply spending time with God thanking Him for each of the blessings that you received throughout the day. In this way, you review your day with Him and notice particularly the moments you are most grateful for. You thank God for each of these moments and you end your time of prayer with a prayer of gratitude for all of the ways that the Lord has shown His love to you.